Do you struggle with frequent clogged drains in your Greece, NY home? If you do, you know how frustrating it can be to try to use your sink, only to find that the water won’t drain. It’s easy to feel frustrated and angry, because you need your home to work well right now, not sometime later or maybe next week. Give us a call the next time your drains clog. 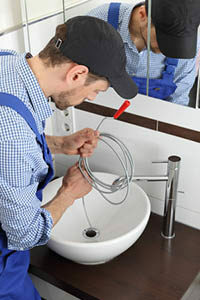 We’ll send out a plumber in Greece NY and get to the bottom of the problem and not only unclog your drain, but do our best to make sure that it doesn’t happen again. We’ll help keep your home running so that you can live your crazy, busy life without worrying about your house. Let us show you exactly why so many homeowners in Greece trust G. T. Campbell. If your drains keep clogging, there could be a number of things going on. Maybe you have a clog in your sewer lines that is causing the backup, some damage to your pipes, or buildup inside of them that won’t go away. No matter what the problem is, we’ll find it and devise a solution for you that will get your house running again like normal. If you want to try some things before we arrive, start by using a chemical solvent on your drains. You can usually find these at your local hardware or home goods store. There are different brands, so you’ll want to find the one that you feel most comfortable using. Keep in mind that they all have slightly different directions, so read the bottle and make sure you feel good about using the product before you try it. In general, these products require you to pour the solvent down your clogged drain, wait a specified period of time, then run water down the drain and see if it has unclogged. The hope is that the solvent will dissolve or eat through the clog so it will be gone. These products are usually pretty safe, though things can still go wrong. Make sure that you leave them in your drain long enough for the solvent to work, but not so long that it has a chance to damage your pipes. While that should take quite a while, we have seen people damage their homes this way. You can also try renting a plumber’s snake at your local hardware store and running it through your pipes. However, we only recommend this if you have previous experience, because it’s easy to get these cheap snakes stuck in your pipes. If this happens, you usually end up having to do a repair that’s much more major than a simple drain cleaning. Since no one wants to pay for more repairs and have their home out of service for any longer than is absolutely necessary, call us instead. Our plumbers have professional grade snakes that can handle any drain without getting caught inside. We’ll show you how easy it is to get your drain unclogged.